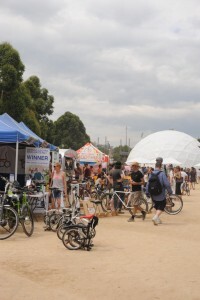 Nestled within the Sustainable Living Festival ‘Big Weekend’, the Treadlie Bike Hub is returning in 2016 with everything you need to fuel a life on two wheels. Stallholders are hand selected from bike distributors, retailers, craftspeople, wholesalers, collectors and enthusiasts and will be bringing bikes, accessories, fashion, experiences and more. The Treadlie Bike Hub features something for every kind of rider and stands will include Dyson Bikes, East Gippsland Rides, Allegro, St Kilda Cycles, Shimano, NE Tourism, The Squeaky Wheel and many more! Situated opposite the ArtPlay building on the banks of Melbourne’s Yarra River, the Treadlie Bike Hub is much more than a market. We kick off a fabulous weekend on Friday night with the Projector Bike Ride. Saturday will see the Treadlie Swap Meet run by Commuter Cycles between 10-3pm, while the amazing guys from Brunswick Cycling Club and Saint Cloud will be hosting Treadlie Roller Racing with prizes from Knogfrom 11am to 3pm on Sunday. There will be a designated bike parking area and of course there is also the chance to test ride every bike imaginable, on what is possibly the most enjoyable test ride area in the known universe.